Well.. first let me re-iterate, that i still stand by my initial feelings that our names for the three distinct areas of the Touchstone Core are appropriately and awesomely named, but I have to say...damn! It is getting very annoying to type "BagItAndTagItPaser" every time Ii need to create an instance of the class...bah! On the other hand I have perfected the rounded form code. It's pretty cool how VS.Net 2003 allows you to bind a form's boundary to a defined region, but i have to admit that its not really easy to use. I found a cool little site with a bunch of useful apps - in particular, one that allows you to get the coordinates of a mouse drawn window. I had to tweak the output, but it's great for anyone interested with the idea of non-standard window. 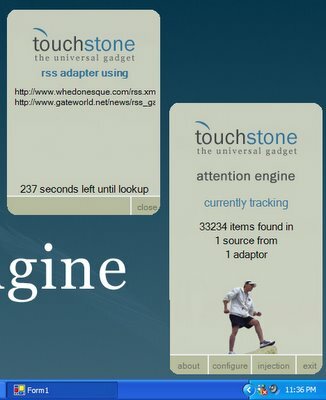 This brings me to the reason for my post tonight, the first OFFICIAL screenshot of the TouchStone Core GUI. I admit that it needs some tweaking, but overall, I think Chris' plans for a simple, clean and elegant GUI are a complete success. I think the man has to go actually. I think it needs to be replaced with the TouchStone "balls". I estimate that the "BagItAndTagIt" Passer should be complete by Monday night. Here's hoping I guess.